Unlike the original Family Beanie Set crochet pattern, this pattern is crocheted with larger stitches to make your project super quick. This pattern set is great for folks who are really busy or for those who just love short projects. 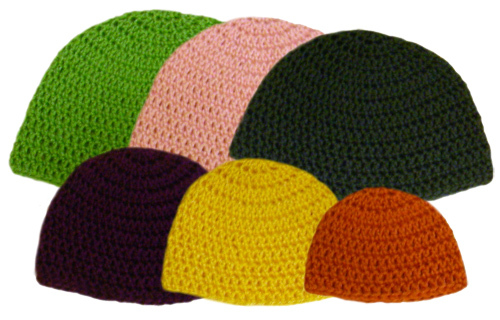 Although beanies crocheted from this pattern are great for keeping your head warm, beanies crocheted using the original Family Beanie Set are even warmer! Both sets are crocheted seamlessly in the round. Need help? Don’t worry, just let me know if you need help while crocheting your beanies! This entry was posted on Sunday, November 7th, 2010 at 9:01 AM by Rachel Choi	and is filed under Best Crochet Patterns. You can follow any responses to this entry through the RSS 2.0 feed. You can leave a response, or trackback from your own site. I love these, I have been making TONS of the other beanies for family and friends. I can’t wait to start making these. I need a hat pattern for this coming winter. I am/was planning on making hats for everyone this Xmas. Until then I love this hat. And wish I could buy it. Thanks Rachel! I am looking for a baby beanie openwork with flower on side, could you suggest how I could get this pattern, or how to do it. Hi Rose! I’d be happy to add your pattern request to my list of things to do. But if you’re feeling adventurous you can modify this pattern by replaces sets of 2 or 3 double crochets with chain stitches. For example instead of doing 8 consecutive double crochets you can do… 2 chains, then 2 double crochets, then 2 chains, then 2 double crochets. You will still be following the pattern and keeping the same stitch count for each round, but creating an open work look at the same time! For the flower, you can crochet any one of the many flowers on this site, feel free to type the word flower into the search box at the top of the page and a bunch of patterns should pop up for you. I just bought this pattern! I’m excited to get started…but I cant get it to come up where i can download/print. Can anyone help?! If you are getting some other error message just let me know and I’ll help you out. I paid for it but I dont have a link or a “My Purchased Patterns” tab to go to and it shows the items in my cart but I know I paid for it because paypal shows the transaction. Ah, I see. You paid with an eCheck, so your payment has not cleared yet. Once it is cleared the pattern will be available to download. eChecks take about a week to clear. If you pay with a credit/debit card or a PayPal account, they would clear instantly since you don’t have to wait for the bank. I bought this and have been having a problem. My circumferences never come out the right size! They are always too big. I am using #4 yarn, a J hook like the pattern calls for and my gauge is what it is supposed to be. I have tried a smaller hook, but that doesn’t really help either. Any advice? Hi Holly, when you crochet your gauge double check to make sure you’re measuring at the widest part of the circle. The circle will be hexagon-like due to the spaced increases, so some parts of the circle will be wider than others. You can also double check to make sure you’re not accidentally adding stitches after each round. The number of stitches at the end of each round will tell you how many stitches are suppose to be in that round. You can also measure the top of the beanie (the circle you create from the rounds with the increases) before you lengthen the hat to see if it has the correct circumference before continuing with the rest of the pattern. Keep in mind that some yarns are stretchier than others so beanies are expected to stretch larger than their finished size when finished and worn.